Robyn ha been waiting with us for a home of her own for over a year now. Her leg has healed well. She is able to manage full walks, she's woken up and is now much less shy and quite the madam! We would love to home Robyn! 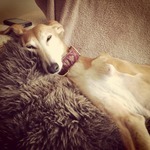 We have a 5 yr old Lurcher X and had a Grey in the recent past for about 12 years. We have had a home visit. How do we proceed please? We are in Wellingborough. Can Robyn cope with walks quite well? How long is she ok to walk please? My boy goes about half an hour twice a day. She sounds a lovely girl and the requirements would not worry me. Thank you. Hello greylover68, if you are considering adopting, I'm just wondering if it might be best for you to complete one of our a pre-adoption forms, if you haven't done so already? That way we will have a much better understanding of what you are looking for and the type of hound that would be best suited to you and your home. If you have already completed a form, perhaps you could let me know your name and I can follow up for you. I have done thank you and spoke to Rachel earlier today. Robyn's on foster with me and she manages walks well now she can easily do longer walks but probably not every day. But she does love to go for walks. She's the sweetest most easy going girl indoors. Out and about her prey drive does kick in.